Last year, more natural gas was produced in British Columbia than at any point in the past 10 years. That may come as a surprise to some people who thought that growth in BC’s natural gas industry hinged on the emergence of a Liquefied Natural Gas sector. It does not. The reality is that even without a much-hyped LNG industry, natural gas production in BC jumped 70 per cent over the past decade with major customers, including Alberta’s tar sands industry, fuelling that growth. And the situation is poised to intensify, with one major player in the industry predicting a doubling of natural gas production and a fivefold increase in the output of gas byproducts (including pentane, butane and condensate), within just two years time. Again, absent LNG. The ecological, human health and safety, and climate costs associated with producing all that fossil fuel is generally very poorly appreciated by those of us living in the urban southwest corner of the province. But ask people living on the front lines about the consequences—the First Nations, farming families and rural communities in the northeast region of BC—and a litany of problems is quickly listed off. The ecological, human health and safety, and climate costs associated with producing all that fossil fuel is very poorly appreciated. A troubling increase in earthquakes. Contaminated groundwater and surface water sources. A sprawling network of unauthorized dams. Rapidly escalating industrial water use and contamination. Massive fragmentation of Indigenous lands and lost opportunities to carry out traditional hunting and fishing activities. Troubling increases in methane emissions at gas wells and other natural gas industry facilities. Ongoing threats of sour gas leaks that can kill and maim. The time is long overdue for a wide-ranging formal public inquiry into how natural gas is produced in British Columbia. What changes are needed? Particularly when we know that every unit of increased gas production in BC requires the use of hydraulic fracturing or fracking—brute force technology that rams massive amounts of water below the earth’s surface to “liberate” gas. Until recently the BC government, which heavily promoted LNG, was utterly dismissive of any suggestion that fracking posed risks. But with a new minority government, the door may finally be opening for natural gas drilling and fracking to get the long overdue public scrutiny they deserve. One thing that wasn’t talked much about during the spring election was that the NDP’s 2017 campaign platform called for a review of fracking. Given the known impacts associated with recent fracking operations in the province, the NDP’s commitment is a starting point. But to be meaningful and effective that commitment must go well beyond simply appointing a scientific panel. The reasons why are numerous. Here are just a few. In August 2015, the largest earthquake anywhere ever scientifically linked to a fracking operation occurred in northeast BC—a 4.6 magnitude tremor. BC Hydro is so concerned about its Peace River dams—among the most critical infrastructure in the province—that it has quietly succeeded in getting fracking banished from near those facilities. Water use at BC fracking operations is off the charts. In the rush for water, fracking companies built dozens of unlicensed dams across the northeast of the province to trap freshwater used in the fracking process while failing to notify those First Nations most directly impacted let alone the general public. Methane is leaking into the atmosphere at numerous gas well sites. There’s every reason to believe that at numerous sites it has also contaminated groundwater sources. Given such realities, a full public inquiry is the least British Columbians deserve. 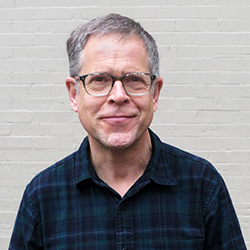 An inquiry where public meetings are held, where witnesses are called and testify under oath, where independent experts provide services as needed, and where a final public report is issued. Have natural gas companies and provincial regulators appropriately consulted with First Nations as required by law and the UN Declaration on the Rights of Indigenous Peoples? What is the true extent of public health and safety risks associated with fracking, including the risks posed by industry-induced earthquakes? Where are outright bans on fracking warranted and what other steps should be taken to comprehensively protect human health and safety? What are the environmental and water impacts? How much could accelerated gas drilling and fracking increase BC’s overall greenhouse gas emissions and what should be done to ensure that industry emissions move steadily down, not up? If current monitoring and enforcement actions are inadequate, what changes are necessary to ensure that natural gas companies comply with all relevant laws and regulations? There is a long history in BC of periodically subjecting management of the province’s forests to independent public scrutiny. To date, no such scrutiny has been focussed on the province’s oil and gas sector. Our new provincial government would provide a valuable public service in immediately rectifying that. 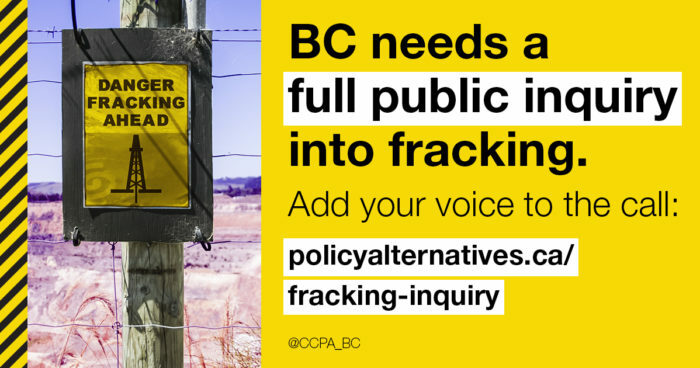 The CCPA is one of 17 organizations calling for a public inquiry into fracking in BC. You can add your voice to the call here.